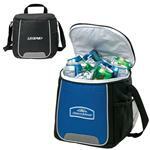 This Coleman Cooler fits 18 cans and features a removable and easy to clean hard plastic FDA approved liner. 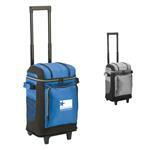 Has a Soft-sided polyester exterior with a heat sealed PEVA lining to keep all your food and drinks cool. 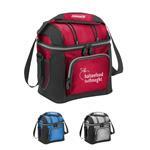 Zippered closure and front pockets. 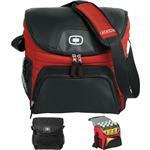 Adjustable shoulder strap and padded top handle for your carrying comfort.